My Home Life Cymru is inviting social care managers to share good practice and learn more about the work of My Home Life Cymru at a series of free events around Wales in October. 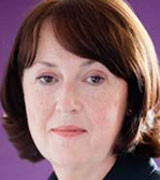 The Older People's Commissioner for Wales, Sarah Rochira (pictured above), will be speaking at the events, following on from her report into the quality of life for older people in Welsh care homes. To book a place please email: mhlc@agecymru.org.uk stating your name, place of work and the best email address to contact you on.